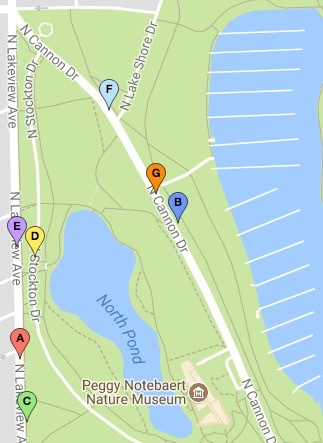 Another robbery outside Diversey Harbor on Sunday evening brings the number of muggings near the marina to seven since June 28. Last night, a 35-year-old Lakeview woman told police that she was walking on the 2600 block of North Cannon Drive when an unknown man grabbed her arm and demanded property around 7:10 p.m., according to CPD’s Office of News Affairs. The woman handed her phone to the man who then fled. She was not seriously injured, police said. No one is in custody. The woman believed that she saw a gun in the man’s pants, but it was not pointed at her, a police source said. She describes the offender as a 5’7”-tall black man with a medium build who was wearing a gray hoodie and ripped jeans. Around 7:45 last Wednesday evening, four young teenagers pulled out a handgun and robbed a man near the Alexander Hamilton statue in the 2700 block of North Cannon Drive. All four then climbed into a silver Honda Accord and fled southbound. Those offenders were described only as three white teenage boys and one white teenage girl. 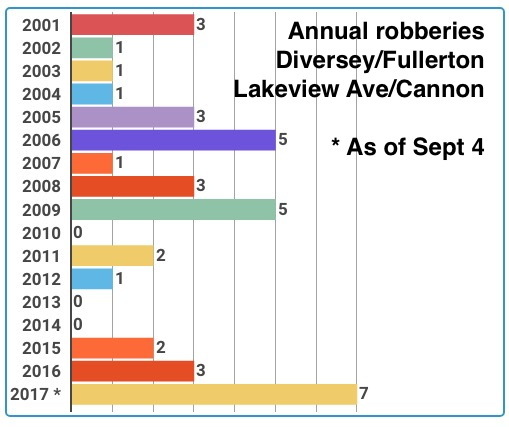 Since June 28, seven people have been robbed in the small corner of Lincoln Park that is bordered by Diversey, Fullerton, Lakeview Avenue, and Cannon Drive, according to city records. That’s more robberies for that area than any full calendar year since at least 2000.